Angharad was born on a Welsh small holding at Llangynwyd, South Wales. Llangynwyd is known for the legend of the Maid of Cefn Ydfa, which inspired the famous Welsh song Bugeilio’r Gwenith Gwyn. Thus Angharad was immersed in music, especially Welsh, from a young age. When she was 7 she began learning harp with Mirain Martin, and piano with Gareth Huw Ifan. She achieved high success at several Eisteddfods playing harp and piano, as well as singing and dancing. As a regular member of the choir of St Michael and All Angels Church, Maesteg, she attained the Dean’s Award from the Royal School of Church Music.Angharad continued studying music at Llanhari Comprehensive School. She performed as a harpist with the Four Counties Youth Orchestra, and received further harp tuition from Lowri Phillips. In 2006, she was awarded a place at the Royal Welsh College of Music and Drama (RWCMD) for a Bachelor of Music degree, studying with Valerie Aldrich-Smith (BBC National Orchestra of Wales) and Meinir Heulyn (Welsh National Opera). She participated in masterclasses with Catrin Finch, Isabelle Perrin, Park Stickney, Caryl Thomas, and Ann Griffiths. She played regularly with the College orchestra, in musical and opera productions, and with the College’s contemporary music ensemble. A personal highlight was performing Choral Dances from Benjamin Britten’s Gloriana, under Adrian Partington (Gloucester Cathedral, BBC National Chorus of Wales). During her time at the RWCMD, Angharad was awarded her ABRSM Diploma in Harp Tuition. She was a runner up in the Blue Riband at the National Eisteddfod, and was the first harp student at the RWCMD to perform her own composition in her final recital. Since graduating from the Royal Welsh College of Music and Drama in, Angharad has performed as a soloist, and an orchestral harpist, across the United Kingdom. Recent performances include recitals at St David’s Hall, Cardiff, as part of the BBC Welsh Proms. Angharad has performed with Catrin Finch (former Royal Harpist), the annual Catrin Finch Summer Academies, Adrian Partington (Gloucester Cathedral, and BBC National Chorus of Wales), and David Jones (Welsh National Opera); and with other ensembles, including Synfonia Newydd, the Rhondda Symphony Orchestra, Swansea Community Orchestra, and Chandos Symphony Orchestra. She toured The Netherlands as guest harpist with the Oxfordshire Youth Orchestra under the direction of Dr John Traill. Angharad performs regularly across South Wales as a freelance soloist; in her flute and harp duo, Golau Gwyn; and with Thomas Morgan in their organ and harp duo. She is musical director of Isca Linea harp ensemble, who have performed twice in the Music for Youth National Festival at Birmingham Conservatoire. She also founded and directs the Llynfi Harp Ensemble. 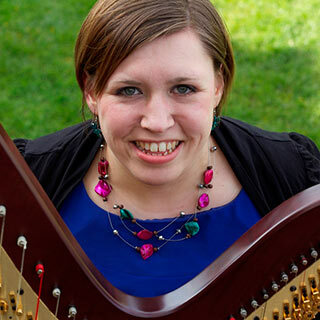 Angharad is a peripatetic harp and piano teacher, and teaches for Gwent Music. She also teaches harp and piano privately, and is the resident harpist at Court Colman Manor, near Bridgend, in South Wales. She works with Telynau Teifi, The Harp Centre of Wales, demonstrating their harps at Eisteddfods and at the centre.